Soar high up above the island of Mauritius as you cherish the most exciting transit from the SSR International Airport to your hotel. Experience a direct helicopter transfer where you will get to your destination much faster and in style with the VIP treatment you deserve. Board comfortably on the reliable Jet Ranger helicopter, and hold onto your breathe for the spectacular, scenic aerial views of Mauritius. As you fly you will enjoy magnificent views of blue lagoons, pristine coastlines, undulating sugar cane fields, meandering roads, majestic mountains, colourful houses and the lush green vegetations of the island. Choosing a helicopter airport transfer is ideal for discerning customers who wish to be treated accordingly. This privileged air flight transfer will spare you from the road traffic on land. With many years of experience in the domain, we assure you, a safe, hassle-free flight. 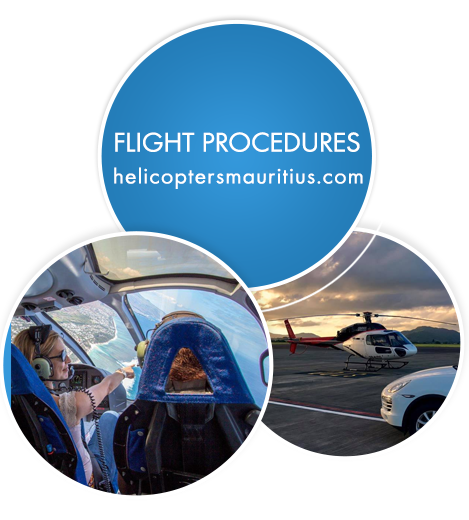 Throughout your helicopter transfer, the enthusiastic and experienced pilots will give you an overview of Mauritius as you fly over amazing landscapes and get to know the country's topography and contours en route to your hotel destination. We wish you a wonderful and safe helicopter transfer ahead. Now that you have made up your mind for a helicopter transfer from the airport to your hotel, the next step is to book with us. Our topmost priority is to ensure your safety aside from a wonderful and problem-free helicopter transfer. In order to enjoy a pleasant flight transfer, it is recommended that you read up on the helicopter flight procedures and safety, whereby you as a passenger can help keep yourself safe. All of the passengers (between 1 to 4 people) are required to hold a valid ticket, issued by the reservation officer before embarking on the helicopter. All flight times quoted are approximate and may vary due to certain variables, such as, but not limited to, weather conditions or aircraft capabilities (for example technical issues). However, we assure you that this is not likely to happen in most cases and you will be informed beforehand. In order to avoid any inconveniences prior to or during your helicopter flight, it is important to follow the safety advice and information. Normally for the helicopter transfer, passengers should be at the airport at least 30 minutes before the scheduled departure time. In case of any problem kindly contact any Air Mauritius Counter in the departure or arrival terminal. Abide by non-smoking rules as smoking is PROHIBITED near or inside the helicopter whether on ground or in flight. Ensure that after landing and disembarking, you leave the helicopter from the front and stand clear of the rotors. As far as possible, children should avoid seats next to the door. Note: Passengers who have special request for their flight should inform the pilot prior to takeoff. These requests will be considered as far as possible and practicable. 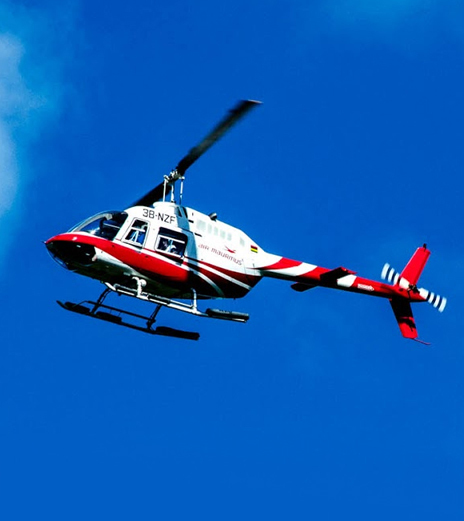 Mauritius has no recorded cases of helicopter accidents to date. This is due to the fact that there are few skyscrapers and the aerial routes are safer and less hectic compare to other countries. The Jet Ranger pilots are experienced in the domain as well, and make sure that your transition is done in the safest manner possible. Helicopters are regularly serviced and maintained in order to avoid any unwanted circumstances. Besides all the safety measures taken, it is still important for you to follow additional safety procedures in order to have a wonderful helicopter transfer experience. Pregnant passengers of 28 weeks or more require a medical certificate from a medical practitioner, stating that the passenger is fit to fly. The medical certificate must be handed to one of the Carrier’s staff member before embarking on the helicopter. Kindly note that all portable electronic devices (mobile phones / tablets etc.) should be switched off or put on Flight Mode, before take-off and during all helicopter flights. Infants (0-24 months), shall only be carried when properly secured with a child restraint device or in the arms of or on the lap of an adult passenger. Should a disabled person be unable to assist themselves in the case of an emergency then that person shall require an able bodied person to accompany them on the flight. The helicopters has limited storage place and accordingly, it is required to consider the luggage limitations when booking the airport transfer service. In case your luggage exceeds the above mentioned luggage limitations, Helicopter Mauritius can provide a luggage land transfer in a dedicated vehicle directly from the airport to your place of accommodation. This luggage transfer service is provided for a supplement cost. For a fast, secure, comfortable and reliable helicopter transfer, rely on our expertise to make your transition as smooth as possible. 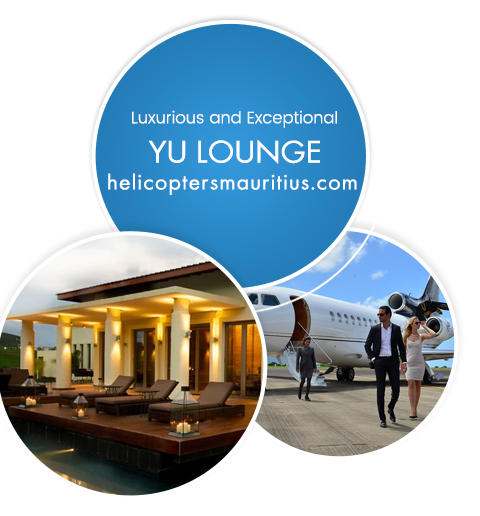 The helicopter airport transfer is done directly from the Mauritius SSR International Airport to your hotel’s helipad. Mauritius has a number of secured helipads which can easily accommodate helicopters. Should your hotel or place of accommodation not have a helipad; Helicopter Mauritius can provide the airport transfer to the helipad closest to your place of accommodation. Free yourself from the stress of the terminal by enjoying the luxurious and modern passenger lounges in Mauritius. Make the most of your airport experience at the cozy lounges where you can relax, grab some drinks, and prepare for your business trip. Settle yourself in a quiet space where you can enjoy the excellent complimentary amenities of the airport lounge in Mauritius. The Amédée Maingard Lounge is designed in a modern, chic and luxurious setting to make your waiting time at the airport as relaxing as possible. The comfy Amédée Maingard Lounge is no doubt the ideal spot where you can relax and refresh yourself after a long and tiring flight or during a long stopover. The hospitable staff members will take care and cater to your needs during your time at the airport lounge. You will be able to benefit from exclusive personal service and access to a Bar & Buffet area that offers a wide selection of food and beverages. The luxurious and exceptional Yu Lounge is meant for the most discerning passengers travelling on commercial airliners and private jets, to make arrivals, stopovers and departures as convenient and seamless as possible. This modern lounge offers the finest in hospitality and travel services, all the way from and to the footstep of an aircraft. As you step off an aircraft, you will be personally welcomed and transferred to the YU Lounge in a luxury limousine. With Yu Lounge you will spend your airport time in a relaxing and conducive environment. You will be able to spare yourself from the hustle and bustle of the airport- the baggage handling, check-in, immigration and customs formalities will be taken care of. In addition, you will be indulged with delectable finger foods, and delicious meals served with a carefully selected wine list, champagne or soft drinks while catering for all of your dietary preferences and requirements.